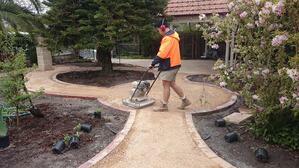 The SoilWorx Path n Drive range of toppings is the perfect way to style your pathways, driveways and footpaths. Designed to compact down firm, especially when finished with a vibrating plate, our range of Path n Drive Toppings are an excellent alternative to asphalt and concrete. Our range of colours will compliment every landscape. The key to installing a long lasting toppings pathway is preparing the base. Follow our guide and avoid the mistakes that everyone else is making. Toppings and crushed rocks are large rocks crushed into smaller rocks by machines. Once crushed, there are particles of varying size and it is the finer dust particles within the product that bind together to make a solid surface when compacted. DO NOT USE WEED MAT! 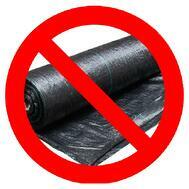 There is a misconception that you need to lay weed mat under toppings to stop weeds from growing. This is a big no no. As mentioned above, the topping contain finer dust particles which bind together to make a solid surface, these particles also need to bind with the existing ground in order to stablise. If there is a weed mat layer between the existing ground and the toppings, the particles have nothing to bind with which then creates an unstable surface. If the toppings layer is unstable, over time, you will start to see cracks in the surface and also the possibility of water pooling under the surface which may turn your toppings into slush. There is absolutely no advantage to laying weed mat since it will not stop the weeds from growing in your toppings. Seeds are blown in by winds and birds drop seeds onto your garden which means that weeds will grow on top regardless of whether there is weed mat. Unfortunately, weeding is a necessary gardening maintenance job just like vacuuming is to housework. When installing toppings, most people tend to put down a 75-100mm thick of toppings directly on their soil, however, if you first put down a base for your toppings, you will find that you can cut the cost of your project and your path will be looking A+ for longer. For the base, we recommend a compacted base of a 20mm crushed rock. Before laying the rock, remember to dig out the area and level it out. Excavate or box up area that you are planning to cover, we recommend the total depth to be at a minimum of 80mm especially if it is for driveway. Driveways need the thicker layer of coverage due to the extra weight and heavy traffic that it will be taking. 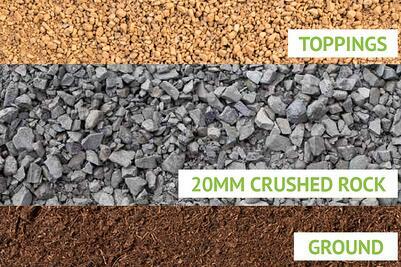 Lay down your base of 20mm crushed rock at a minimum depth of 50mm. Spread and level the 20mm crushed rock using the back of a rake or straight length of timber. It is not advised to use a rake with the prongs down, as they tend to pull the larger rocks out leaving patches of stony material. Water the crushed rock LIGHTLY with a hose. Do not soak. Compact the area with a vibrating plate or roller. Making sure you fill any dips or holes to make a smooth and even finish. Once the crushed rock has been laid and compacted, repeat steps 2-5 with the toppings. Good preparation ends in a good result!